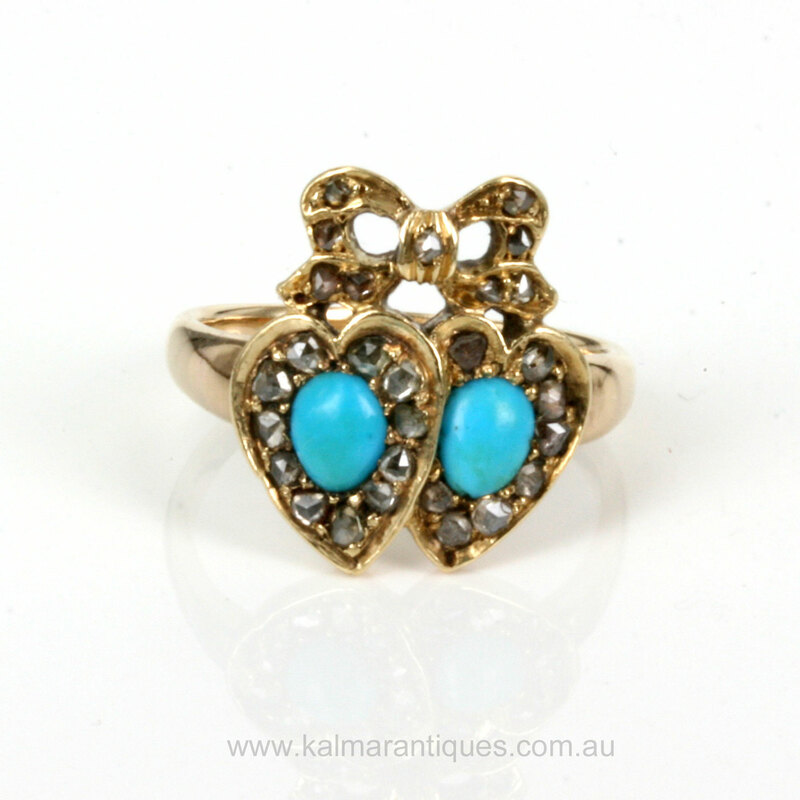 Antique turquoise and diamond double heart ring. Product code: ES2502 Categories: Antique, Antique Engagement Rings, Antique Rings. The Victorian era was one of romance and beauty and here is a very beautiful antique ring from the Victorian era that has so much character and romance associated with it. 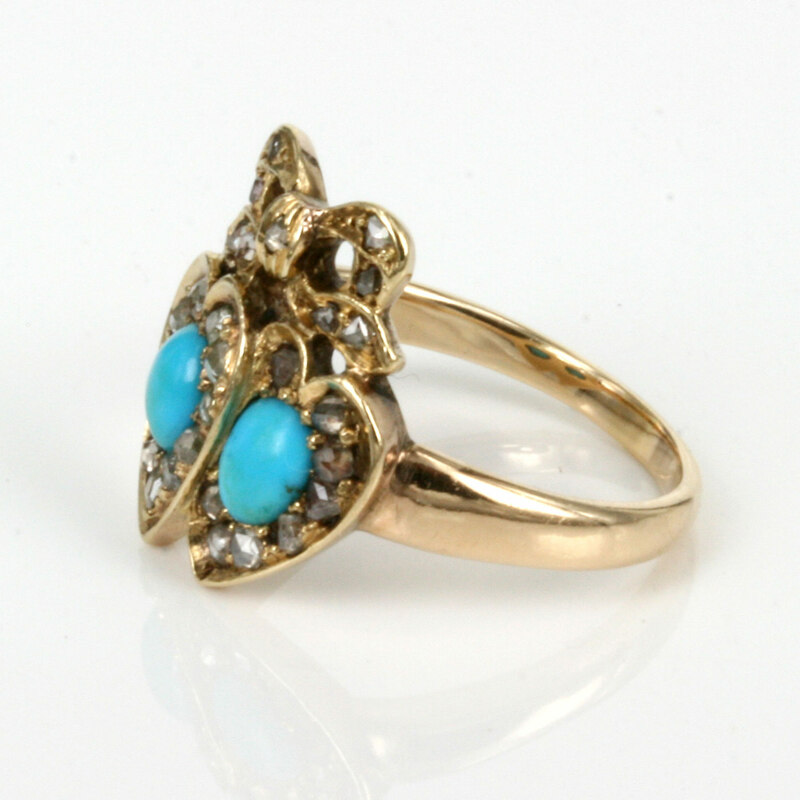 Made in 15ct gold, this enchanting antique ring is of course set with turquoise and diamonds, however it is not just the turquoise and diamonds that makes it exciting and full of character, it is the lovely from of two entwined hearts that make it so special. Typical of the jewellery dating from the 1870’s, this is a stunning Victorian era ring that looks so amazing on the finger. The turquoise has such an amazing colour and the border is set with 19 rose cut diamonds. And true to form of a romantic Victorian ring, the two hearts sit under a bow design set with a further 9 rose cut diamonds. From left to right the ring measures 15.4mm across by 16.8mm and this is the style and type of ring that stands out so perfectly on the finger. The two hearts and the bow make this such a delightful antique ring and the turquoise and diamonds add so much more charm and character and really stands out on the finger, and is a wonderful antique ring that will always be appreciated and loved.